Thanks for the headsup anyway. I am still struggling if i get this one or Chromaphone (or other stuff from Applied Accustics). 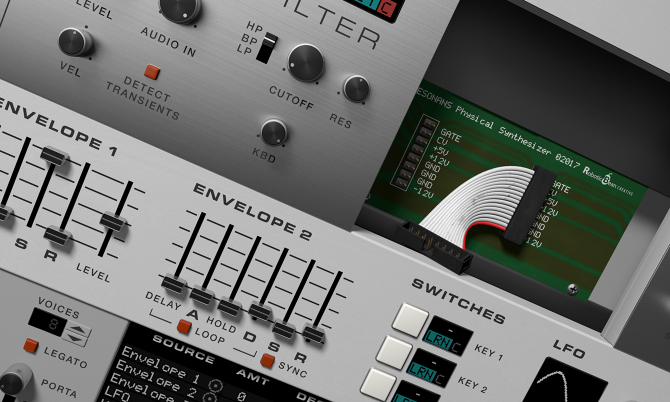 FYI, I've not tried Chromaphone yet, but Ultra Analog-2 really struggled in Reason: with other plugins I tested, Reason could run 80-90% of instances that Bitwig or Live could, but with Ultra Analog-2 it was more like 20-30%. It was a night & day difference. If it's one of the plugins that struggles in Reason because of the fixed 64-samples buffer, then I'm afraid their other synths & effects might be the same. I remember trying it and thought it was cool but a little pricey. When I trialed it, it felt like it was only capable of a small range of sounds. What is the secret to getting interesting sounds out of it? I will frequently purchase a synth, find it isn't as good as I hoped and then have this strong internal challenge arise, to figure out a method to invoke it's particular magic. You know your on to something when you feel compelled to rapidly be saving patches, telling your self "just one more" for the 100th time @ 2:00 in the morning. Well, I don't want to be disparaging, the sound quality is definitely up there and some of the patches in the factory sounds are excellent. We'll just have to see what some of these fevered patching nights you mention will yield. I love that the circuit board shows up when you disconnect the resonator btw, great touch. A great purchase for people like me (no sample libraries, more modeling, endless experimentation). Not sure if Bud got around to making some tutorials. Its easy to get into but certainly not the norm in sound shaping... i.e, exactly the kind of thing I like. Modeled sounds aren't quite as interesting as regular synthetics, but they're really not going to be, not in the way that an analog or FM or wavetable sound would. Not that they aren't interesting, they're just aiming to emulate an actual instrument using physics. For me, I find it interesting because I can remain in synthetic territory, while sounding "sort-of" a guitar. You can get PVC tube sounds, drums, odd stringed instruments, hums, scrapes. Sounds one could do on a guitar if they were so determined. I don't play guitar, so this works for me. The same here. I guess you can get more out of it by using different samples. I hope i can give it a spin soon and try out different things. I personally like the GUI. I agree a good looking GUI can make me use a device as a goto and feel like i am "home" and get inspired. I really dislike uber fancy honky tonky tinkerbell GUIs. What is your suggestion "Resonance" should look like? But for example, the layout is very uninspired, from afar looking like Parsec or Hydronexius, but unlike those doesn't really reflect the signal flow and underline the uniqueness of the synthesis method... 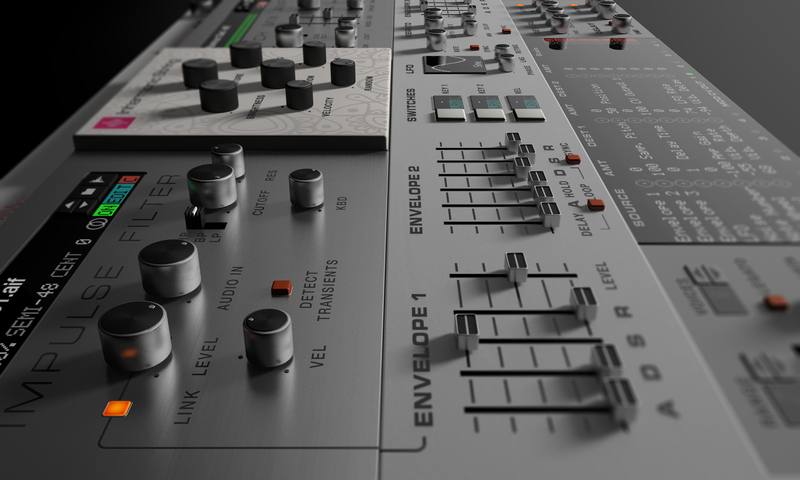 The knobs and faders are very flat and "boring", looking like a templates from RE SDK. The brushed metal textures are repeated instead of creating a coherent look of a single piece of equipment (VK-1 and FM4 in particular pull that look off much better). Hum... i am just giving a spin and it looks like it misses a retrigger control. The voices get stolen pretty fast and than only legato is playing until all notes released again. Or maybe i just miss something? Check out this songfile if you want. Ok, Resonanse is ersiously on its own category. Not the normal synth. Its phyical modelling is godd, guess you got it, for physical moddeling. Its not the best for real snappy sounds, but good pads, resonating sounds and string types. The reverb sounds pretty good. Changing the input can create (for me) unpredictable sounds, but still of a resonating or string type with a different character. Here is a little example of a piano type sound (a lil bit saturated, and some additional delay and reverb on top). Tbh, i miss some more control over the snapiness of the sound attack. Due the delay-type of sound it is hard to control how the sound will shape. Maybe an additional filter before the amp instead of only the resonators would help. I'm a big fan of the GUI! The GUI looks alright to me. Some of the knobs might be on the smaller side, other than that it looks fine I think. Wish I still had my trial left. It can certainly give that impression at first, but it's surprisingly versatile once you get to know it! It definitely grows on you, which I experienced first hand during the 8 months of development. The approach to designing sounds with it is quite different from what you're used to with subtractive synths. It's also easy to get distracted by the sampler (which I sometimes wish I had added in an update instead). The real strength of Resonans is of course in plucked and struck sounds. One of the best Impulse sources for this is actually the built-in pluck mode (i e no sample loaded, envelope link turned off), which is actually a small physical model within itself. You can use it with the filter pretty much open to give the resonator a little more to work with, or apply some LP with a bit a resonance for a more synthetic character to the sound. They key to making interesting sounds with this synthesis model is to use plenty of modulation. I usually map velocity to Brightness (which is prewired for this reason), but also to Damping or Structure. You can get some pretty cool performance variations by using velocity, the mod wheel and the key switches to alter brightness, decay, switch to legato on the fly, enable the vibrato etc. You can also get some pretty cool effects by sweeping Position or Structure with an LFO (although you might need to turn up the Sub Osc if you're messing around a lot with the Structure since it easily becomes inharmonic). For making sustain sounds (Env 1 link turned on) you probably want to apply some pretty heavy LP filtering if you're using the internal noise source. I know that tutorial videos are long overdue, and I'm really hoping to get around to it eventually!